When I got wind of Stila's new primer, I was so excited to try it. With hyaluroic acid in it along with spf, I thought, great, killing a couple of birds with one stone. Hydration, sun protection and base all in one. 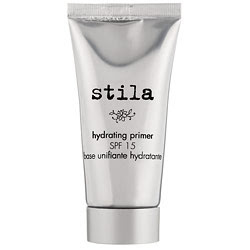 Claims: Hydrating Primer SPF 15 is Step 1 in Stila's 4-steps to a purely flawless face. This good-for-you primer provides time-released skincare benefits and maintains hydration levels in the skin for a perfectly-prepped palette. The innovative formula contains Dermaxyl for anti-aging and hydration benefits, and time-released Hyaluronic Acid spheres that plump the skin for a soft, moisturized feel. Perfect for all skin types. Well, first off, the consistency of the primer was a little thicker than primers I have tried in the past. Not thick like a cream, but more of a lotion. In the a.m. I applied my moisturizer, then the primer. I usually wait a few minutes for the primer to "set in" before applying makeup, but this one didn't disappear into my skin. Anyway, I then buffed, tapped and swirled a little Bare Escentuals foundation on, a little blush and I was off. My face looked fine when I left the house. Mid-day, however, my face was way too shiny, especially my forehead area. I'm thiking this primer is too much hydration and not enough priming. I didn't feel like it kept my makeup in place and flawless. Also, I noticed a few little bumps on my forehead when using this (very tiny, nothing MAJOR, but they were still there). Since I thought it was too much hydration, I decided to skip my moisturizer and just apply the primer after washing my face. Nope. Now my issue was parts of my face weren't hydrated enough. And still, later on in the day, it looked like my makeup was wearing off. This primer is too much work and too much figuring out. I don't agree that it is great for all skin types. It did not agree at all with my combination skin. Overall, me no likey!